We went a bit wild for easter here at The Happy Weaner, we decided to go LIVE and show you all the amazing things you can do with your little one without a chocolate easter egg in sight (all the more for you to eat!). We were both in front of the camera this week and we had a ball, watch our LIVE below and join in with our chocolate free egg hunt, bunny hats and easter baskets and don’t forget to bake a few Hot cross muffins. So much easier than buns and equally delicious! Did you leave that easter bonnet until the last minute to make? This is a mega easy easter hat, easily customisable to a variety of head sizes! 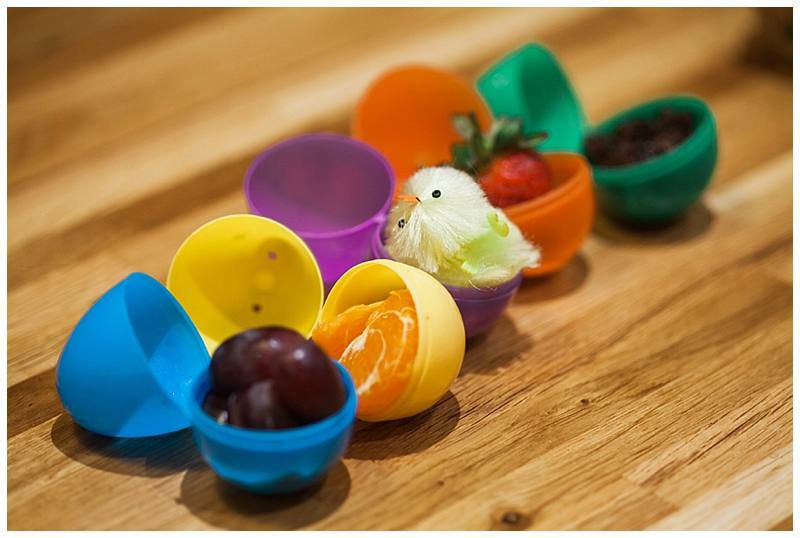 We do love a bit of healthy eating here in The Happy Weaner kitchen so this year, as our babies are still small we decided to make our easter egg hunt chocolate free! Claire tried it out over the weekend and our healthy treats went down a storm. We got hold of some empty plastic eggs from a local store and filled them with treats. you can put whatever you like in your eggs but we found grapes (don’t forget to cut them in half with our handy grape hack) raisins, satsuma slices and strawberries, were a big hit. Peek-a-boo egg on a peg! And to finish why not make a rabbit shaped jelly?! As you can see ours worked out really well! OOPS!